Research published in Nature Communications led by graduate student Yimin Luo shows how fields generated by a liquid crystalline environment can be used to make a simple glass particle follow sophisticated trajectories. 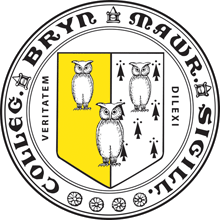 Dr. Lisa Tran will be a Simons Junior Fellow in August 2018, and will join the Department of Physics at Bryn Mawr College to become an assistant professor starting August 2019. Congratulation Lisa! Yimin Luo is invited to give a seminar at University of Washington Distinguished Young Scholar Seminars to show case her research. 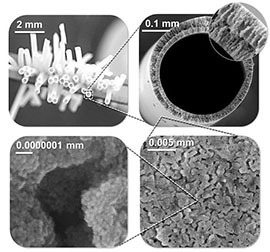 Filtration membranes are, at their core, sponge-like materials that have micro- or nanoscopically small pores. Unwanted chemicals, bacteria and even viruses are physically blocked by the maze of mesh, but liquids like water can make it through. Researchers led by Martin F. Haase at the University of Pennsylvania have a new way of making membranes that could address this problem. Their method allows them to add in a host of new abilities via functional nanoparticles that adhere to the surface of the mesh. Inspired by how geometry influences physical systems such as soft matter, researchers led by graduate student Nathan Bade at the University of Pennsylvania have revealed surprising insights into how the physics of molecules within a cell affect how the cell behaves. 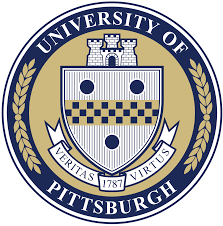 Dr. Tagbo Niepa will join University of Pittsburgh to become an assistant professor of Chemical and Petroleum Engineering starting Fall 2017. Congratulations Tagbo! 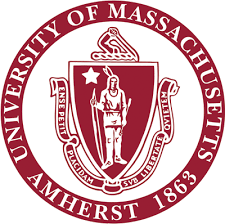 Dr. Laura Bradley will join University of Massachusetts Amherst to become an assistant professor Department of Polymer Science and Engineering starting Fall 2017. Congratulations Laura! Tagbo Niepa and Laura Bradley are featured on the CBE website. Langmuir "Curvature-Driven Migration of Colloids on Tense Lipid Bilayers"
Inspired by proteins that generate membrane curvature, sense the underlying membrane geometry, and migrate driven by curvature gradients, we explore the question: Can colloids, adhered to lipid bilayers, also sense and respond to membrane geometry? We report the migration of Janus microparticles adhered to giant unilamellar vesicles elongated to present spatially varying curvatures. In our experiments, colloids migrate only when the membranes are tense, suggesting that they migrate to minimize membrane area. By determining the energy dissipated along a trajectory, the energy field is inferred to depend on the local deviatoric curvature, like curvature driven capillary migration on interfaces between immiscible fluids. In this latter system, energy gradients are larger, so colloids move deterministically, whereas the paths traced by colloids on vesicles have significant fluctuations. 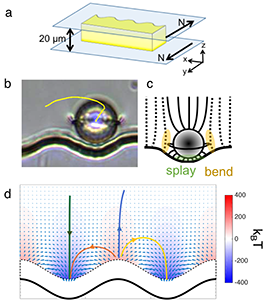 By addressing the role of Brownian motion, we show that the observed migration is analogous to curvature driven capillary migration, with membrane tension playing the role of interfacial tension. 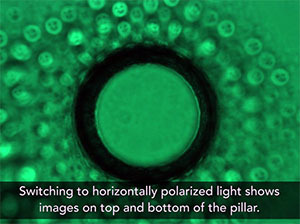 Since this motion is mediated by membrane shape, it can be turned on and off by dynamically deforming the vesicle. 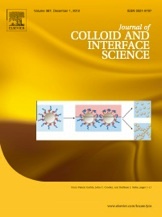 While particle–particle interactions on lipid membranes have been considered in many contributions, we report here an exciting and previously unexplored modality to actively direct the migration of colloids to desired locations on lipid bilayers. 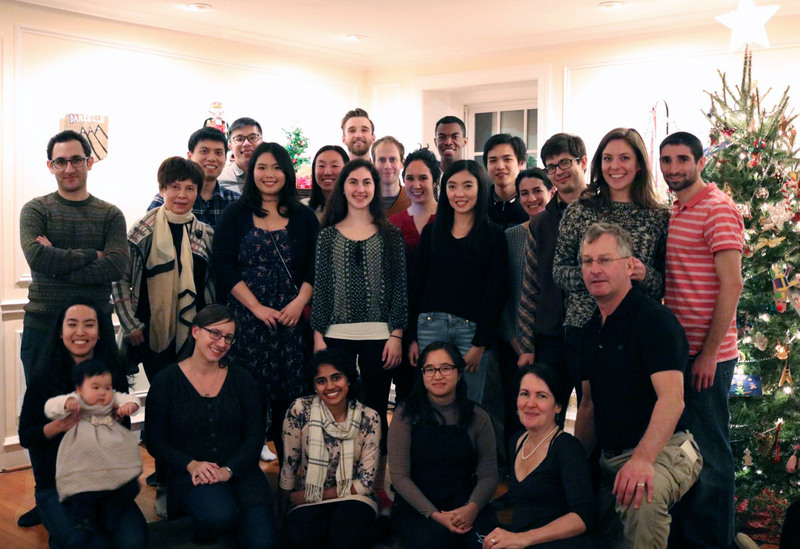 The Stebe Group, friends, and families gathered for a holiday party at Professor Stebe's house. 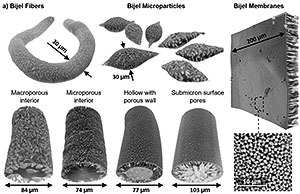 Janus particles are colloidal analogues of molecular amphiphiles that can self-assemble to form diverse suprastructures, exhibit motility under appropriate catalytic reactions and strongly adsorb to fluid-fluid interfaces to stabilize multiphasic fluid mixtures. 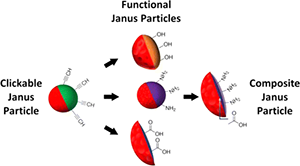 To enable their widespread utilization, scalable methods that allow for the synthesis of Janus particles with diverse chemical compositions and shapes are highly desirable. We synthesize clickable Janus particles containing a click-active acetylene moiety that can be functionalized through thiol-yne click reactions with commercially available thiols. 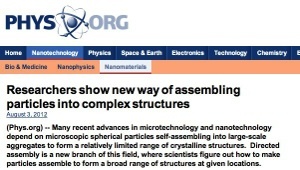 Our ability to design the structure and composition of diverse colloids will provide versatile new building blocks for self-assembly. 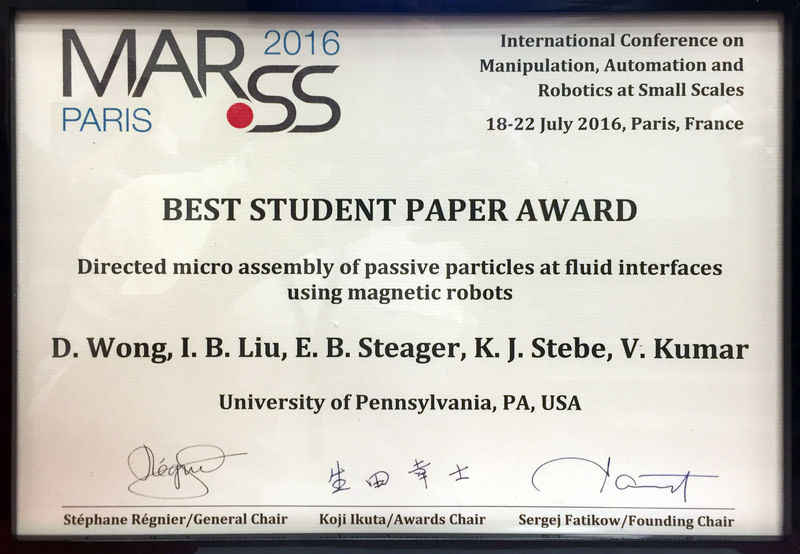 Best student paper award: "Directed micro assembly of passive particles at fluid interface using magnetic robots" by D. Wong, I.B. Liu, E.B. Steager, K.J. 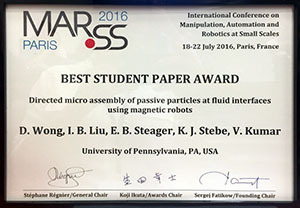 Stebe, V. Kumar, International Conference on Manipulation, Automation and Robotics at Small Scale (MARSS), 18-22 July 2016, Paris, France. 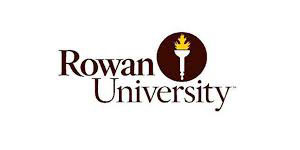 Dr. Martin F. Haase will join Rowan University to become an assistant professor in Chemical Engineering starting September 2016. Congratulations Martin! 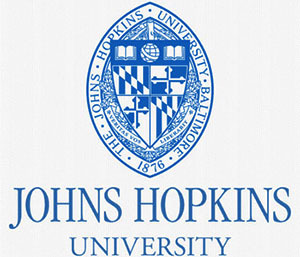 Dr. Francesca Serra will join Johns Hopkins University to become an assistant professor in Physics & Astronomy starting November 2016. Congratulations Francesca! 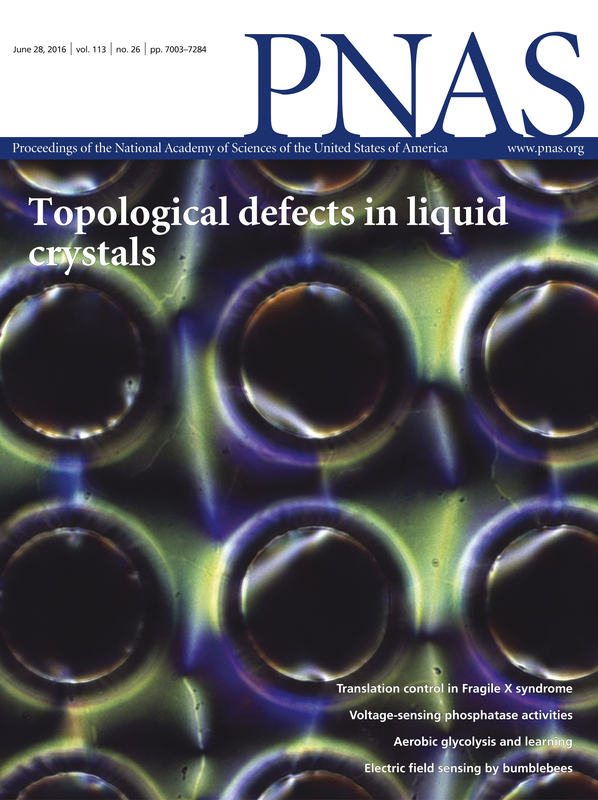 Lassoing Saddle-Splay: Geomeotrical Control of Topological Defects" Lisa Tran, Maxim O. Lavrentovich, Daniel A. Beller, Ningwei L, Kathleen J. Stebe, Randall D. Kamien is featured on the cover of PNAS. 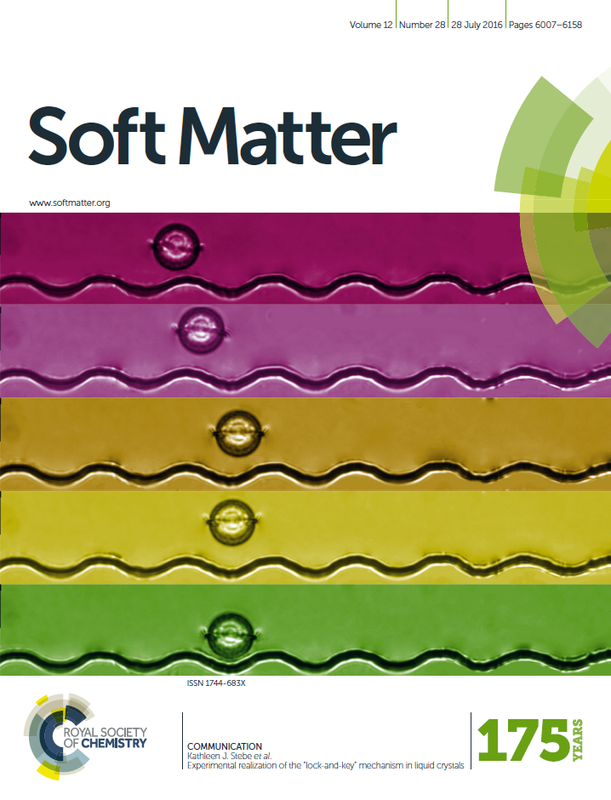 "Experimental realization of the "lock-and-key" mechanism in liquid crystals" Yimin Luo, Francesca Serra, Kathleen J. Stebe is featured on the cover of Soft Matter. 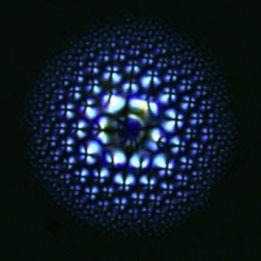 "Inverted Cheerios Effect" video by Martin Hasse was featured by NY Times. 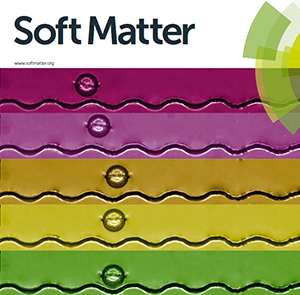 Novel soft material synthesis with liquid phase architecture and interfacially active particles. 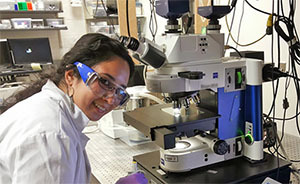 Researchers in the Stebe and Lee labs have designed a method based on solvent transfer-induced phase separation (STRIPS) to continuously generate asymmetric and hierarchical bijels. 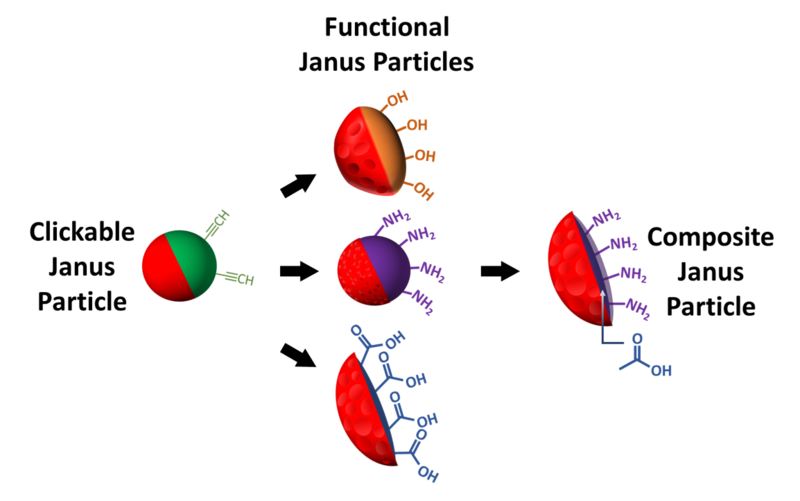 We combine strategies for particle assembly in soft matter with the robotics lab at Penn, Dr. Vijay Kumar's group, to develop means for controlled interaction. We use a robot that serves as a programmable source of fluid curvature and allows the collection of passive particles. When settled on a fluid interface, the magnetic robot distorts the interface, which strongly influences curvature capillary migration. The shape of the robot dictates the interface shape, for example, by imposing high interface curvature near corners, create sites of preferred assembly. This freedom to manipulate interface curvature dynamically and to migrate laterally on the interface creates new possibilities for directed bottom-up particle assemblies and precise manipulation of these complex assembled structures. Since the passive particles can be functionalized to sense, report and interact with their surroundings, this work paves the way to new schemes for creation and control of functionalized micro robots. Penn engineers and physicists find a new way to employ liquid crystal to create microlens arrays organized in a flower-like texture mimicking the compound eye in nature. The collaborative endeavor is led by Francesca Serra and Mohamed Amine Gharbi, postdoctoral researchers in the Department of Physics & Astronomy in the School of Arts & Sciences, along with their advisers Kathleen Stebe (Chemical and Biomolecular Engineering), Randall Kamien (Physics and Astronomy) and Shu Yang (Material Science and Engineering and Chemical and Biomolecular Engineering). 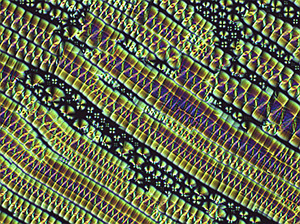 Image chosen as "Best Artistic Award" in the NBIC NanoDay 2014 image contest. Description: A thin layer of smectic liquid crystal is spread out on a glass substrate. Liquid crystal molecules in contact with air prefer a perpendicular alignment, while in contact with the substrate, molecules prefer a planar alignment. 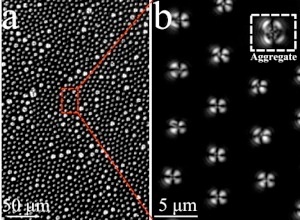 To satisfy such alignment, smectic liquid crystal molecules can form two types of defect: focal conic domains and oily streaks. Smectics manifest extreme sensitivity to boundary conditions, in a small region both patterns emerge, interlacing each other, resembling ancient woven textiles. This image shows such a region under cross-polarizer, where focal conical domains emerge as four brushes, while oily streaks look like close-packed tiles. Dr. Van Truskett has received the 2014 Industrial Research & Development Award from the American Institute of Chemical Engineers (AIChE) for her contributions to the development and commercialization of core technology used in Jet and FlashTM Imprint Lithography (J-FILTM). "The Industrial Research & Development award honors individuals or teams working in industries served by chemical engineers for innovation that has resulted in the successful commercialization of new products and/or new processes for making useful products." After his collaborative postdoctoral work with Prof. Kathleen J. Stebe, Prof. Randy Kamien and Prof. Shu Yang, Dr. Mohamed Gharbi has joined Prof. Mark Sutton and Prof. Linda Reven at McGill University as a Postdoctoral Research Fellow. Liana Vaccari has received recognition as a Gulf of Mexico Research Initiative Scholar as part of the DROPPS Consortium. 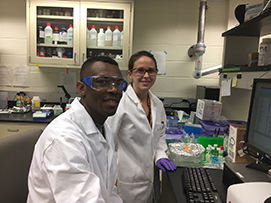 "The Gulf of Mexico Research Initiative (GoMRI) announces their Scholars Program to recognize the graduate students whose vital research contribute to improve understanding about the damage, response, and recovery following the Deepwater Horizon oil spill." Dr. Lu Yao has successfully defended his PhD dissertation and has joined the Dow Chemical Company as Senior Engineer. "Controlling liquid crystal defects" Mohamed A. Gharbi, Daniel A. Beller, Apiradee Honglawan, Kathleen J. Stebe, Shu Yang and Randall D. Kamien: A novel approach to control the arrangement of the smectic layers to form flower texture on curved surfaces can potentially be used to create lenses.